Backstage is a powerful niche theme design for musicians and artists showcasing their media, upcoming shows and music using hugely flexible custom widgets and audio players. This beautifully crafted layout was designed by Elliot Jay Stocks and boasts 7 alternate styles. 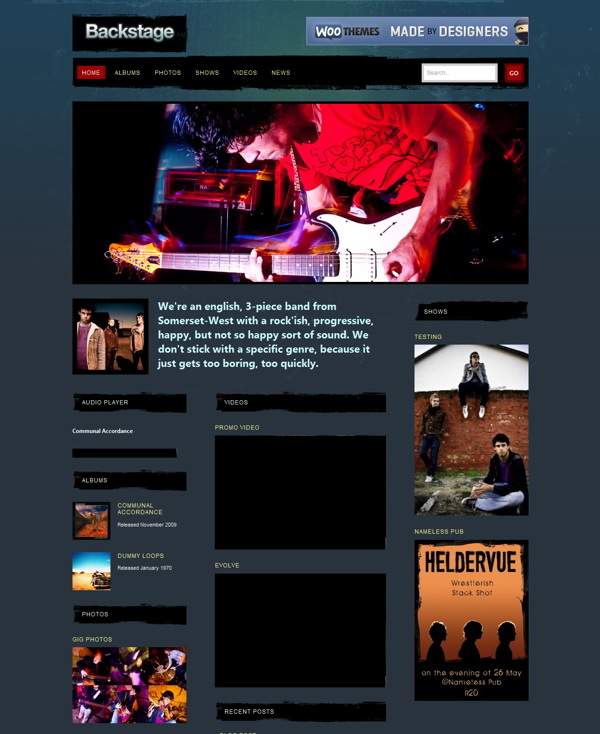 You get a home page slider showcasing band/musician photography, a home page dedicated module to the band/musician biography. Unique page templates for your discography/music archive, and image & video galleries. Neat theme integration with media attachments. Custom Woo Widgets for use in the sidebar and in the home page widgetized zones: A media widget showcasing images, videos or music, a recent news widget, an upcoming shows widget, Flickr and advertising widgets amongst others. Making simple changes without editing code, like adding your own logo, changing to an alternate color style, adding Google Analytics code, couldn’t be easier with the back-end theme options panel. The theme is compatible with all the modern web browsers like Firefox, Safari, Chrome and Internet Explorer. There is an image resizer script built into the theme framework to automatically scales your post images for pixel perfect display in our templates. No need to upload new cropped images when re-designing your website. It comes packaged with a .po file for easy WordPress theme translations into your desired language – editing one neat little file without hunting down text in the theme templates.